UNESCO's vote to deny Jewish and Christian connections to Jerusalem and the Temple Mount is dismaying but not surprising. Cutting those connections – understood by anyone with a passing knowledge of Judaism and Christianity - has been a goal of Palestinians and their Arab and Muslim supporters for decades. Except for boilerplate about "affirming the importance of the Old City and its walls for the three monotheistic faiths" the resolution does not acknowledge that Jerusalem has any, much less unique, significance to Jews and Christians. The phrases "safeguarding of the cultural heritage of Palestine," and "Al-Buraq Plaza 'Western Wall Plaza'" –in quotes that mock the fact that the Western Wall is Judaism's holiest site - show what the resolution is really about, adopting the narrative that Jerusalem is sacred only to Muslims. UNESCO has long condemned the "Judaization" of Judaism's holiest city and now votes to place the Muslim narrative on a pedestal and to ignore Jewish and Christian connections. But what is the Muslim narrative? UNESCO has adopted the narrative that Jerusalem is sacred only to Muslims. For Islam, Jerusalem is less a holy city than a rallying cry and a prize to be denied to others, especially Jews. Jerusalem is not mentioned in the Qur'an at all and there is no explicit connection between the city and Muhammad's life. 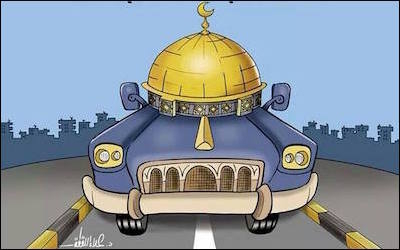 The location of the "farthest mosque," which he visited on the flying steed Al-Buraq, was not specified in the Qur'an but only later when Jerusalem was already under Muslim control. Muslim tradition preserves the idea that the earliest mosques originally faced Jerusalem not Mecca, and also that Muhammad himself changed this. But usurping Christian and Jewish connections to Jerusalem also date to the beginning of Islam. The seventh-century Al-Aqsa mosque was built atop an earlier Christian church, which stood above a Roman temple. All of this stood on the platform built by King Herod to house the second Jewish temple, where Jesus threw out the money-changers, which itself replaced the temple of Solomon, built around 900 BCE. Muslim interest in Jerusalem has fluctuated over the centuries, always as a result of politics. The Muslim connection is far later than its predecessors', and Muslim interest in Jerusalem has fluctuated over the centuries, always as a result of politics. Though early Muslims regarded Jerusalem as one of three sacred cities, after Mecca and Medina, its significance fell and was resurrected only when it was used as a rallying call by Saladin, who wrested it back from the Crusaders. Wresting the city back from the Jews has been a rallying cry for Palestinians and Muslims since the nineteenth century. Now the lie that "al Aqsa is in danger" – allegedly threatened by Israeli encroachments and archaeology – has been enshrined in a UNESCO resolution. Never mind the fact that for over a decade Muslim authorities on the Temple Mount have excavated into its heart, tearing out Christian, Jewish and earlier remains to convert underground spaces into mosques, without the slightest regard for history, much less the sensitivities of other faiths. The UNESCO vote is harmful in two ways. For one, it shows how Palestinians and their supporters will subvert any international institution in order to vilify Israelis. More deeply, it is another example of how the world has entered a dangerous period of historical revisionism, where large and small lies undermine what is known about the past in order to justify the present. Palestinians and their supporters will subvert any international institution in order to vilify Israelis. Russia has stated that its annexation of the Crimea and territorial claims in the Ukraine and Baltic states will reconstitute the mythical Russkiy Mir or "Russian world," which is genetically and morally superior to the mercantilist West. China lies to its people that the Communist Party was instrumental in winning World War II, while Japanese historical revisionism has long claimed that there was no massacre at Nanking or exploitation of Korean "comfort women," that Japan "liberated" Asia and was the "victim of American aggression." Lies about Israel are commonplace, not least of all claims of "genocide" and "ethnic cleansing" perpetrated against Palestinians. Defining genocide down from mass murder and away from any association with millions of Jews murdered by Nazis has been a Palestinian line for decades. Now Jerusalem – mentioned more than 800 times in the Bible, and the direction of Jewish prayer for 2 thousand years – is on the chopping block. There are a few encouraging signs. Countries that usually vote against Israel in the UN, like India, abstained. There have been a series of condemnations from UNESCO's Director General Irina Bokova, who said, "To deny, conceal or erase any of the Jewish, Christian or Muslim traditions undermines the integrity of the site," and from figures such as the Italian Prime Minister, Matteo Renzi, who called the vote "incomprehensible, unacceptable and wrong." Few countries will be moved by the latest round of blustering threats from the Palestinian Authority to introduce even more strident anti-Israel resolutions and deliberately damage UNESCO further. Supporters of peace should remind UNESCO that the true meaning of Jerusalem is not as a prize or a weapon but as a shared place of holiness. If Jerusalem can be disconnected from Jews and Christians then everything is up for grabs.